Technology has changed tools incredibly over the years, but some of the best things stay the same. Case in point: the hammer. Many different types of hammers have been created throughout the years — everything from simple wooden mallets to state-of-the-art titanium alloy ball peen hammers, but they all have similar characteristics. While a hammer is a pretty simple tool, there are more elements to it than one might realize at first glance. Let’s look at the basic parts that constitute the hammer. The handle is one of the most important parts of a hammer, since you’ll be gripping it each time you use it to drive nails, tent stakes, or whatever you plan to do with it. Wooden and fiberglass handles dominate the market. Handle length is typically determined by how much force is needed from the impact of the hammer face. As handle length increases, accuracy decreases. For example, this is why a sledgehammer handle is longer than a framing hammer handle which is longer than a ball peen hammer handle. Rubber grips are among the most popular on hammers fiberglass handles and needed for shock absorption (especially the case with steel handles). They’re simply the most comfortable and provide less slippage. Typically, wood handled hammers don’t have or need a grip or cover. The head, or anvil, is the part of your hammer that does most of the real work due to it providing the necessary weight. It also varies the most, other than the handle, even among standard claw hammers. While a large head can theoretically get the job done more easily, many people prefer a lighter head for more precise work. The face is the element of a hammer that actually strikes nails and other material so it sees the most punishment. Diameter is key here; tack hammers typically have smaller faces, while sledgehammers are obviously much wider. The best claw hammer faces usually fall somewhere in the middle. The claw is the part of the hammer that acts as a pry bar, and is used for pulling nails, and ripping wood and other materials apart. The most common is the curved claw which most people have used at one time or another. Straight claws and rip claws are also common. Some hammers don’t have a claw and instead have a peen or even something different. Simply put, the cheek is what holds everything together. It’s the part of the hammer that receives the most stress and is often the weak point in most subpar hammers. This part is more important on wooden handle hammers than others. The neck of a hammer plays two important roles: connecting the head to the handle and providing balance to the hammer. The length will vary, depending on the type of hammer you choose. 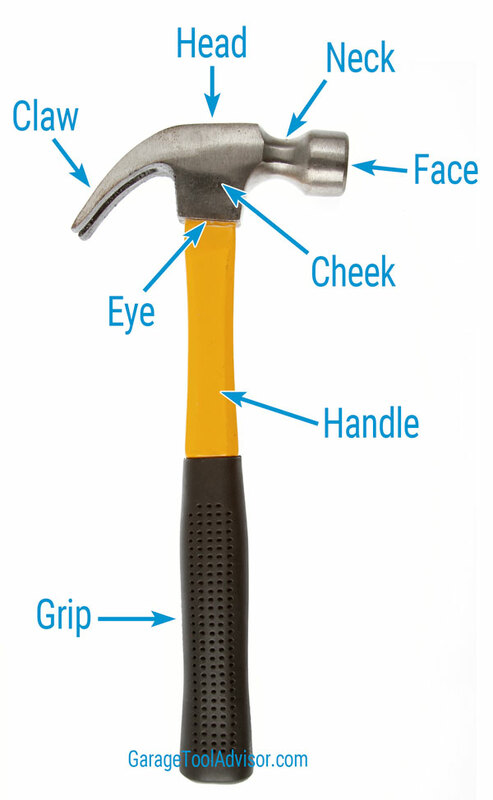 The eye is located at the bottom of the hammer’s head, allowing it to slip over the handle with ease. Steel hammers don’t feature eyes–they’re more common on hammers with wooden (and occasionally rubber) handles.